#GHTC2016 | and sure stars shining . . .
A compilation of food and drink shots from the last 3.5 weeks of travel . . . . Lunch of a sausage roll, crisps, Victoria sponge. Fish & chips from a market stall. Jacket potato with cheese at lunch, with salad. And some gooseberry and elderflower cake. Yes, I stopped in this candy shop. The remains of a sumptuous Indian feast at dinner. We took the leftovers to homeless on the Cathedral green. Duck for my birthday luncheon! This entry was posted in Food, Travel 2016 and tagged #GHTC2016 on July 31, 2016 by Jeffrey Carter. Choir and clergy after final service. Final view of cathedral. I bowed and left. This entry was posted in Episcopal Church, Travel 2016 and tagged #GHTC2016 on July 25, 2016 by Jeffrey Carter. I am in Norwich. The cathedral is literally across the street. The hotel is lovely, as was lunch of a sandwich and crisps in the cathedral refectory. I am SO looking forward to this week here in this beautiful city. This entry was posted in Episcopal Church, Travel 2016 and tagged #GHTC2016 on July 18, 2016 by Jeffrey Carter. This entry was posted in Choral Music, Episcopal Church, Travel 2016 and tagged #GHTC2016 on July 16, 2016 by Jeffrey Carter. Our official group photo at Exeter Cathedral, 15 July 2016. 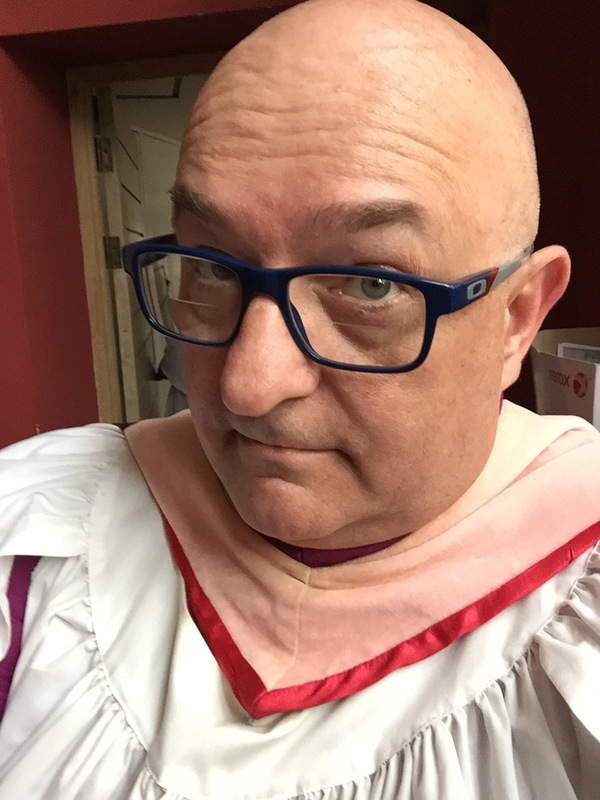 This entry was posted in Choral Music, Episcopal Church, Gigs, Travel 2016 and tagged #GHTC2016 on July 15, 2016 by Jeffrey Carter. We sang Evensong today, yes we did! But we took off early today to Plymouth to visit the national aquarium. And be tourists. Several of us took in the Plymouth Gin distillery tour. I ate curry for lunch! This entry was posted in Travel 2016 and tagged #GHTC2016 on July 14, 2016 by Jeffrey Carter.